El mejor alojamiento ImpressPages: SSD, Anti DDoS, Free SSL, etc. Thanks to boing6000, you can assign icons to your plugin in Setup/plugin.json file. Changes in admin session handling: Admin session was never expiring if server session timeout was set to infinity. This now has been fixed and your login will expire if you close the browser for 30 min. If you keep the browser open, the session should never expire. If you want to change 30 min. to something else, add 'sessionMaxIdle' => number_of_seconds to the config.php file. 3 Noviembre 2016 - 21MBWe haven't touched the core features for a while. 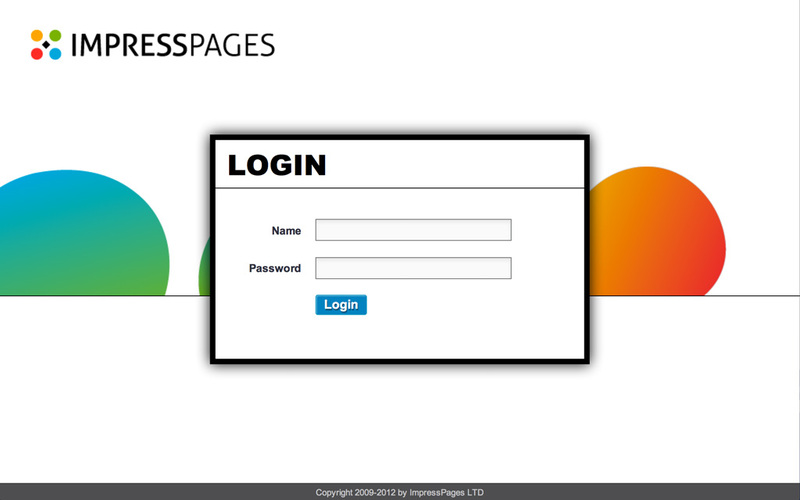 Now decided to do some refactoring in the bootstrap engine of ImpressPages. None of your websites should be affected due to this change because just very specific functions have been changed. Nevertheless, we state it as a major version update, so that you double-check if you don't use any of changed functionality. Please see the list bellow for all changes. Fixed CSRF check: Apparently, CSRF check was broken in recent version. Please make sure all your code passes securityToken value when doing POST requests as doing POST without securityToken will fail after the update. Fixing compatibility issues with the changes on Google Maps. 30 Marzo 2016 - 21MBThis release brings a bunch of fixes and improvements. User-friendly layout naming is now available thanks to Deimantas. 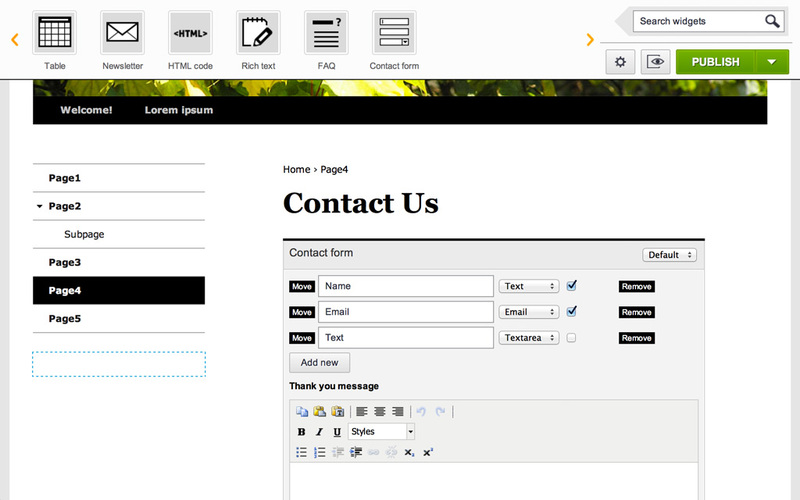 Added Date and Time input fields  support in forms generally and in contact form widget. No support in GRID yet. 1 Noviembre 2015 - 21MBThis release brings a bunch of fixes and improvements. 5 Agosto 2015 - 21MBThis release brings a bunch of fixes and improvements. 26 Junio 2015 - 21MBThis release brings a bunch of fixes and improvements. 18 Mayo 2015 - 21MBThis release brings a bunch of fixes and improvements. The one worth looking at is that Map widget doesn't support width adjustment anymore. Now it is always takes 100% of the container width. This was necessary to fix responsiveness bugs. 12 Marzo 2015 - 21MBThanks to HalcyonD we have widget grouping. All core widgets go to the group Core. 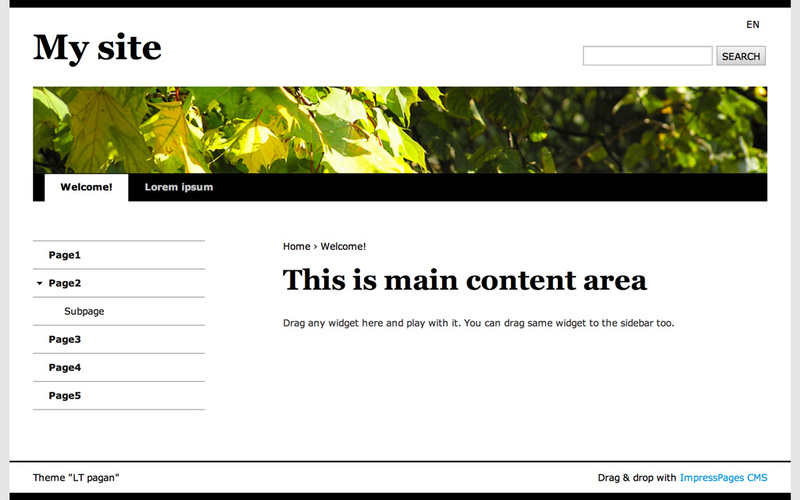 If a plugin introduces several widgets,  they go to the separate group. All single widget plugins go to the group Other. 30 Enero 2015 - 21MBWe are very happy to announce an availability of multilingual fields in GRID. That brings the whole concept of a GRID to the new level. GRID sortDirection config fix ipRoute()->name() method to get the name of current route. 26 Noviembre 2014 - 21MBImpressPages GRID is one of the most powerful tools enabling you to create data management tools in minutes. 21 Noviembre 2014 - 21MBThis release was encouraged by the community. We have added text color tools to the default text editor, an interface to choose items per page count in GRID, and better Right To Left language support. layout setting in all GRID fields. 7 Noviembre 2014 - 21MBThis version includes many small improvements. The change worth to mention is trailing slash added at the end of each page url. Old websites will keep having the same URL structure. But newly installed websites will have trailing slash at the end of all URLs. In case you don't like it, you can turn it off in Configuration section of admin. In theory pages with trailing slash at the end should load faster in Apache. In either case, all pages will be accessible without trailing slash too and will have canonical meta tag to avoid content duplication and make it perfect for both: users and SEO. style select interface for Colorbox plugin attributes setting support in text slot. 27 Octubre 2014 - 21MBThis version includes more config options, updated translations and many small fixes. 16 Octubre 2014 - 21MBThis version fixes missing encoding capabilities on some servers. 14 Octubre 2014 - 21MBThis version improves the usability of the Pages section and fixes a critical bug in email queuing. Now when creating new page, you can choose where new page has to be placed: on top, above selected page, as a child, bellow selected page, at the  bottom. In addition to that ImpressPages remembers your last choice for each menu making it feel like ImpressPages knows what you want. Removing the page is much easier now as you can use 'delete' button on your keyboard. And after the deletion of one page, the next one is being selected. So you can quickly remove a series of pages without touching the mouse. 4 Octubre 2014 - 21MBThis version provides small fixes and improvements. 26 Septiembre 2014 - 21MBThis version provides an immediate bug fix to pages management. 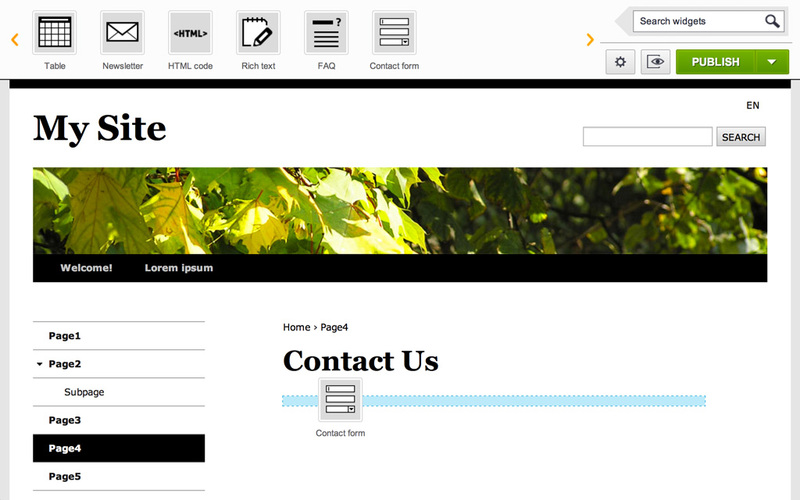 Fixed list/blog style pages management in pages section. 24 Septiembre 2014 - 21MBThis version contains small fixes and community requests. Don't throw html2text warnings / errors while sending emails. Updated main GRID view file (Ip/Internal/Grid/view/placeholder.php). Please update if you have overrides of this file. 14 Septiembre 2014 - 21MBThis version comes with ecommerce support for regular payments and subscriptions. We have separated checkout logic from payments. That means all payment methods available on ImpressPages can be used on any plugin no mather that they were build by different authors. Last release made Languages section unusable on PHP 5.3.x servers. So we are releasing an immediate fix alongside additional improvements. 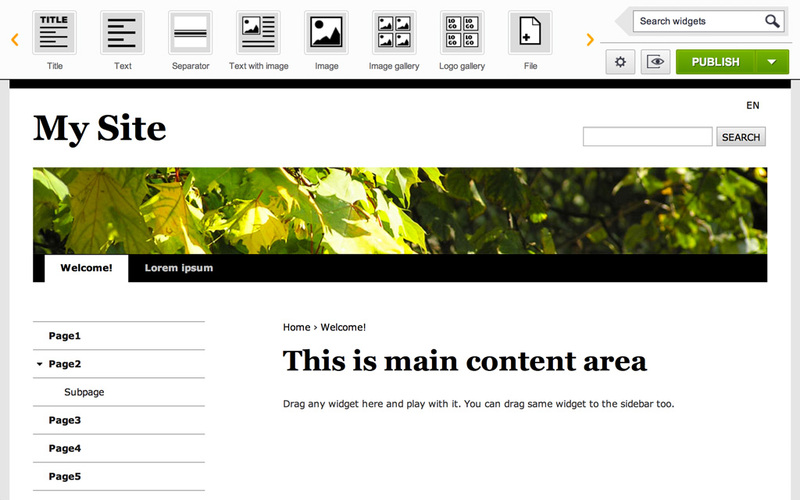 GRID improvements: Many big improvements comes to ImpressPages GRID. Now you can use tabs, nested tables and even do the recursion to mimic tree or other structures. nginx support: ImpressPages has been adopted and tested on nginx. UHU!!! Thanks to Bruno Skvorc for help. Easier admin submenu: It was a big pain to create a plugin with more than one menu item in admin area. Now it's easy. Just add @ipSubmenu docblock above the controller method an it will appear as a submenu under your plugin. 24 Junio 2014 - 21MBImpressPages 4.1 comes with a much anticipated Plugin Market. ipGetOptionLang and ipGetOptionLang now accept language code instead of language id. use ipGetOptionLang('Config.websiteEmail') and ipGetOptionLang('Config.websiteTitle') instead of ipGetOption to get website email and website title.